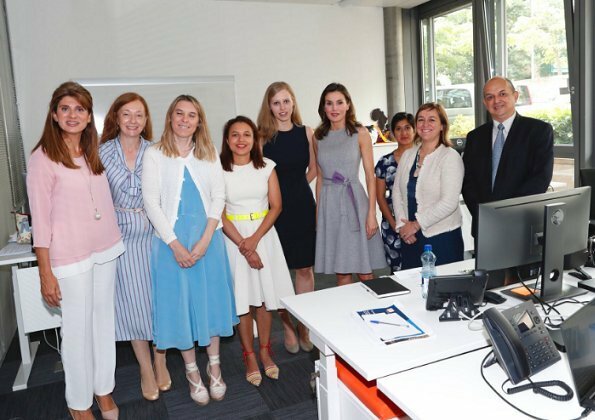 On May 31, 2018, Queen Letizia of Spain visited the headquarters of the Union for International Cancer Control (UICC) in Geneva, Switzerland. The Union for International Cancer Control (UICC) is a membership organisation that exists to help the global health community accelerate the fight against cancer. Queen Letizia is honorary president of the Spanish Cancer Association AECC. I love that dress of Letizia´s. A stunning outfit, with and without the matching coat. This is a superb look for Letizia -- fresh, flattering, ladylike. The purple accents make for an unusual color combination that really works. Yes; the word "fresh" is often used to describe a look that has an upbeat, vivacious quality. The sort of attire that brings out a youthful (as distinct from childish or adolescent) quality in the wearer, regardless of her age. Sometimes Queen Elizabeth and Queen Margrethe wear outfits that I would describe as "fresh" but still age-appropriate. That is how I see the dress and coat that Letizia chose here. Aquí en España está muy de moda q la madre y las hijas lleven el mismo estilo de ropa y vayan a juego, no entiendo mucho eso the "childish"..., entonces los niños con jeans van vestidos de mayor?? En mi época no llevábamos pantalon largo hasta los 12 años..
O sea que eres un hombre? Anonymous at 11:32 PM, I'm afraid I don't know Spanish well enough to understand your reply, but in case my use of the word "childish" threw you, you may not have understood the context. I was saying that Letizia's attire here brings out a youthful quality in the wearer, not a childish quality. Imo it is wonderfully sophisticated, in fact. Jane Chantal, it is very normal a woman wear that kind of coat as same as the daughters, it's for all not only children... here in Spain.. Thank you for the translation! :-) As I have already said, I love Letizia's outfit here, and one of the things I admire about it is that it has a fresh, youthful yet very sophisticated vibe. I am totally a fan of the custom of little girls wearing a miniature version of a beautifully-tailored coat their mother is wearing. From Haiti, back in Spain, and now in Switzerland, one busy Queen! Love this dress with lavender coordinating belt. Miss the jacket, but it was in the 70s in Geneva today, so maybe too warm. Pretty dress - I like the full skirt and the purple accents on the bow. Very nice dress also like the lilac on the inside of the belt. All the Ladies look good. Queen Letizia appears stunning and classy in that outfit and love the shoes! Its a nice look. Though I think it is a bit unappropriate to wear sleveless in the meeting when the men wears costume. This dress fit and flare of this dress is perfect. She should have a few more made in this style. Excellent cause. Es un vestido muy lindo, le queda muy bien. Personalmente lo prefiero en el otono con el abrigo pero eso es solo un gusto personal. La reina Letizia tiene buen gusto. Me da la impresion que en algunas ocasiones esta insegura, como en alguna de estas fotos. Espero que yo este equivocada puesto que ella tiene cualidades para cumplir un buen papel como reina, lo que no debe ser nada facil. Animo reina Letizia, siga adelante! Precioso vestido. Carolina Herrera es muy buena opción para la Reina Letizia por su estilo elegante y femenino. Queen Letizia looks very beautiful. Queen Letizia of Spain looks very beautiful.